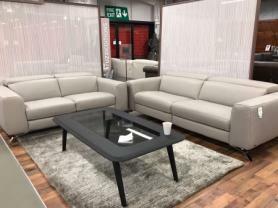 Natuzzi Editions Cinema sofa has arrived first at the U.K.’s largest Natuzzi Editions Gallery at Furnimax Accrington Lancashire. The wedge tables are very handy with storage and drink facilities. The lights are touch sensitive which add to the beauty of the sofa. This sofa is modular hence can rearranged according to your room. Approximate Measurements: L: 380 cm D: 103 cm.